Posted By:Unknown | At:12:30 PM Be the first to comment! 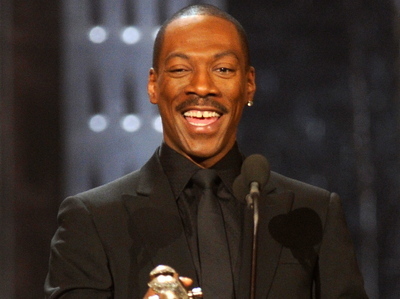 Reports are circulating that Eddie Murphy is in talks to host the 84th Academy Awards. Now wouldn't this be a coup for the Oscars as well as Murphy. We already know the Oscars is a melanin deficit show so why not put a little color in the host position. At least that would take away some of the sting of not having any person of color actually getting nominated for an award. It'll also be a way for the Academy to make up for not giving Murphy an Oscar for his mesmerizing role in 'Dream Girls'. I kid the Oscars. I know I can be a little tough sometimes. I mean honestly, I know it's not the Academy's fault they can't find people of color to nominate for awards...SMH! But anyway, it would definitely be a way for Murphy to put himself back on the radar and display his undeniable talent. Besides, he also has a film coming out in November called 'Tower Heist' which is directed by Serena Williams' ex-boyfriend Brett Ratner. So we'll see. Maybe this'll be the year of Murphy.